Happy New Year! 2017 was a busy year for us between planning the expansion of our current location and prepping to open a second location in Santa Barbara. We’d like to thank you all for an amazing 2017 and for your continued support. We are expecting 2018 to be even more memorable! Be on the lookout for new beers, new pizzas and more exciting IAC news coming your way in 2018. Our January specialty pizza is Chicken Broccoli! This pizza has chicken, broccoli, spinach, bell pepper and onion topped with a spicy avocado drizzle. 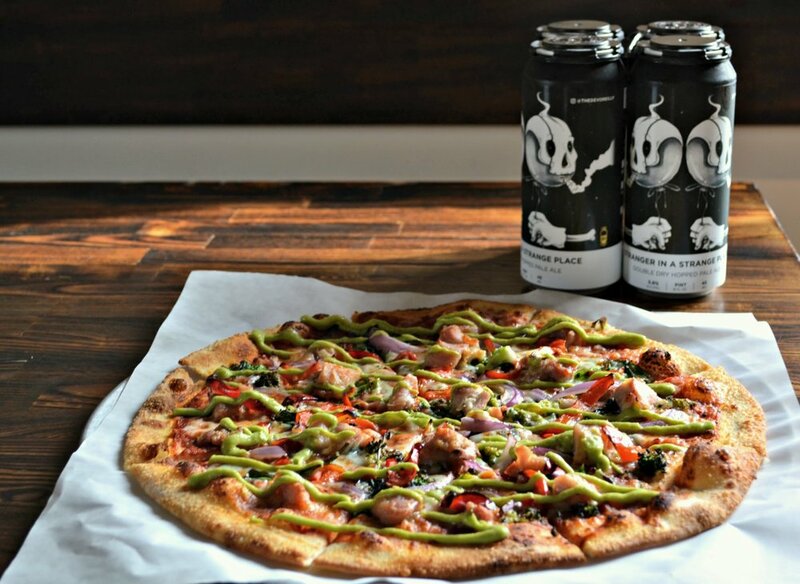 This pizza pairs great with Stranger in a Strange Place pale ale. We have two can releases available now! 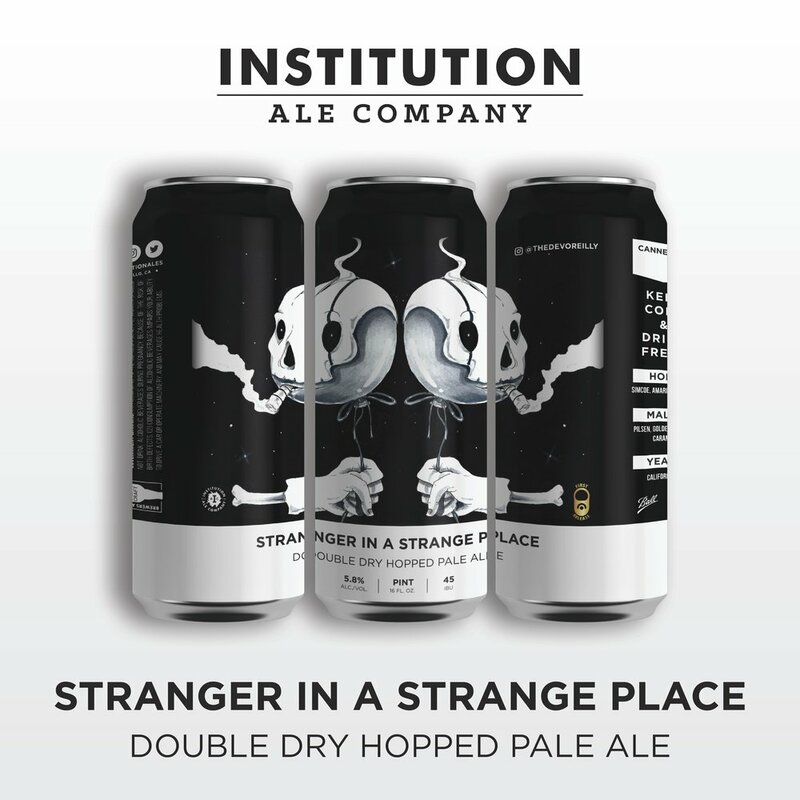 Stranger in a Strange Place, this brand new dry hopped pale ale has Amarillo, Mosaic and Simcoe hops. It’s super tropical and easy drinking at 5.8% and 45 IBUs. 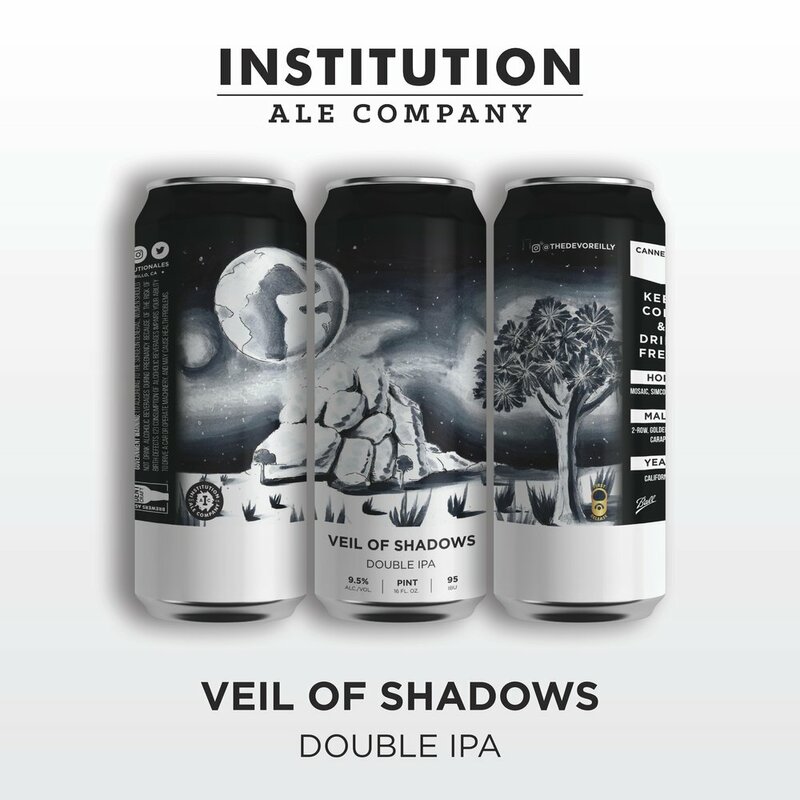 Our second can release this month is Veil of Shadows. This new double IPA has Cascade, Mosaic and Simcoe hops. Dank and citrusy with mouth coating, lingering bitterness at 9.5% and 95 IBUs. Come get a 4-pack before they’re all gone! Keep an eye out for more releases later this month. 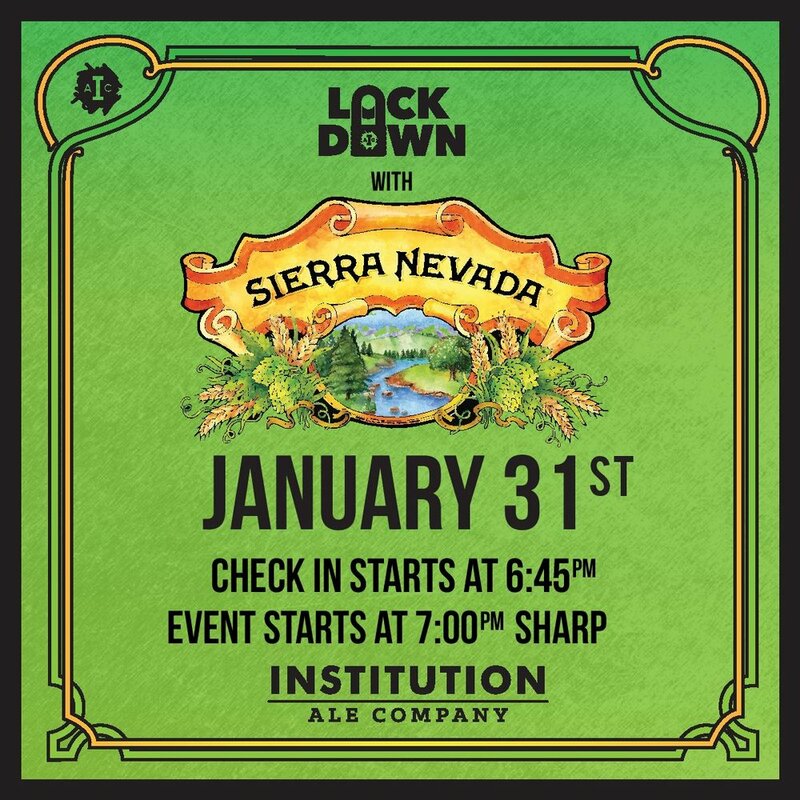 Lockdown: Featuring Sierra Nevada Brewing Co.
Lockdowns only happen once a month and feature a special guest brewery and their favorite beers on tap at IAC. On Wednesday, January 31st at 7:00pm, we'll be hosting a tasting in our brewery with Sierra Nevada's Brand Ambassador Steve Grossman. This is an awesome opportunity to sample some amazing beers from one of the craft beer's pioneering breweries and hear their amazing story. Ticket price includes a flight of five tasters and a full pour of your favorite from the flight. Because this event is taking place in our brewery and not in our tasting room, this will be a ticketed event with limited seating. 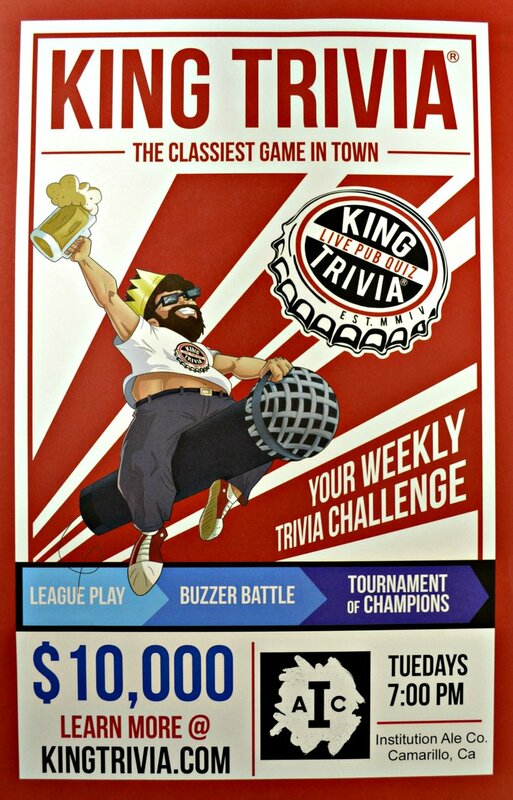 Don't miss out on this one night only event. Click here to purchase tickets. One of our original beers, Sedation combines malty and toasty flavors with floral and citrusy hop flavors. It's brewed with Centennial and Cascade. A super sessionable wheat beer featuring fruity Nelson hops. It’s refreshing and easy drinking with bright hop character but minimal bitterness. A new IPA recipe with a light malt profile and huge hop character. Citra, Simcoe, Amarillo. Our brown ale balances toasted dark malts and American hops. Hard maple wood adds a woodsy dryness and slight maple sweetness. Centennial and Cascade hops. Our coffee oatmeal stout is back and we'll be serving it on nitro and CO2 - meaning all you dark beer lovers can take growlers home. Coffee, chocolate, and light smokiness are highlighted flavors in this beer. Our coffee oatmeal stout will be served on nitro! Coffee, chocolate, and light smokiness are highlighted flavors in this beer. Our flagship brown ale got a dose of cherries, vanilla beans and Ecuadorian cacao nibs. Peach Day Dreamin’ is part of our Day Dreamin’ series of fruited golden ales. This beer is light and easy to drink, with fruity sweetness that's not overpowering. A new stout recipe brewed with raspberries, Madagascar vanilla beans and cacao nibs. Look for this beer in cans later this month! Our triple IPA is heavily hopped with an impressive lineup: Amarillo, Centennial, Simcoe, Mosaic, Columbus & Warrior. This beer only comes out once a year, so savor it while it lasts: Look for a small amount of cans to be released towards the end of the month. Our annual barleywine is back, checking in at 11.7%. Expect big hop bitterness balanced by layers of caramelized and toasted malts. Here's what's on tap currently in the tasting room as of January 2nd. 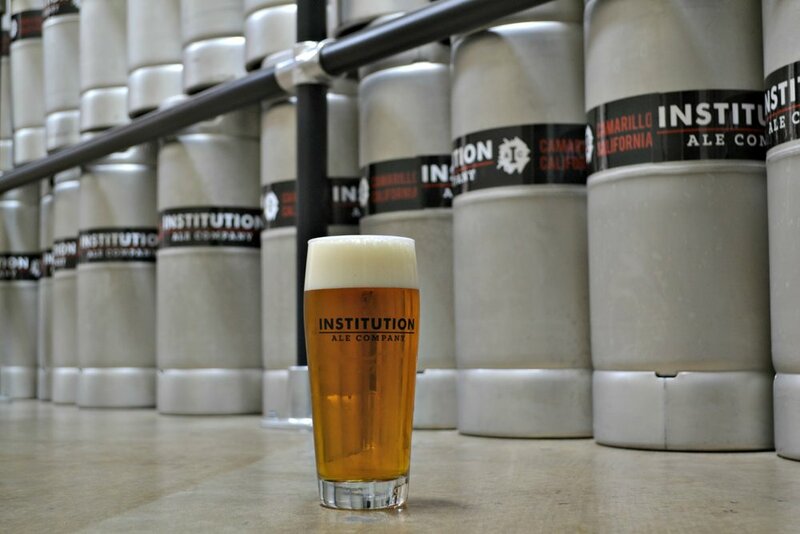 Visit www.institutionales.com/on-tap/ anytime for a daily updated tap list. Lockdown: Featuring Sierra Nevada Brewing Co. (Wednesday, January 31st): This is an awesome opportunity to sample some amazing beers from one of the craft beer's pioneering breweries and hear their amazing story. Ticket price includes a flight of five tasters and a full pour of your favorite from the flight. Because this event is taking place in our brewery and not in our tasting room, this will be a ticketed event with limited seating. Don't miss out on this one night only event. Click here to purchase tickets.